Hello, I’m Teri Page. Welcome to Homestead Honey! Homestead Honey is a space for inspiration, resources, and information. I share and celebrate the many joys, and also the real-life trials of homesteading, while offering you tools and support to live your homestead dream. I’m the author of the book, Family Homesteading, and also a life and business coach who works with women in all stages of their homesteading journey. In 1999, my then boyfriend, now husband Brian decided to attend a sustainable living skills internship in the Willamette Valley of Oregon. I was offered an opportunity to work-trade in the organic garden. For four months, I hauled manure, tended seeds, watered beds, and made compost, and by the end of the summer, I had been transformed. My eyes had been opened to the possibilities of small-scale organic agriculture. 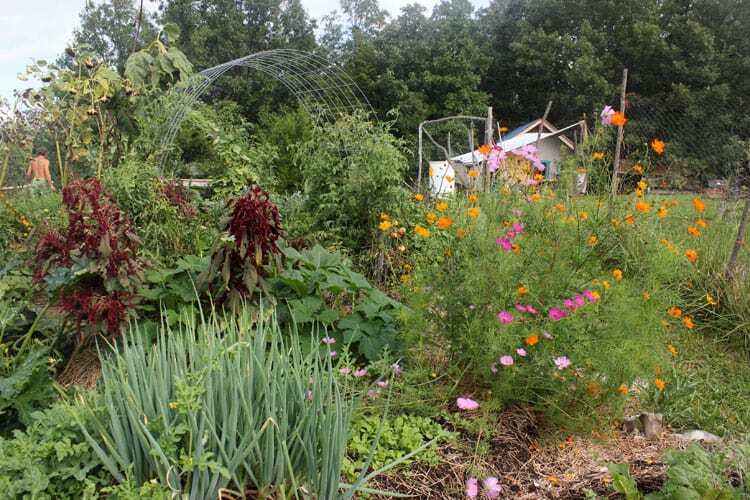 Yearning to grow our own food, we moved to a rental cabin on 35 acres and our homesteading journey began. From gardening and food preservation, to raising chickens, ducks, goats, bees, and pigs, we developed dozens of homesteading skills. And of course we made many, many mistakes along the way. In October, 2012 my family of four packed up our Oregon homestead of 13 years and moved next door to good friends in Northeast Missouri, where land was cheap, building codes are lenient, and opportunities for alternative building and off-grid living abound. We spent six years building an off the grid homestead from scratch, creating and cultivating organic gardens and food forests, and building off-grid infrastructure such as a homestead root cellar and an outdoor pizza oven. Building without debt led to some pretty radical lifestyle choices. For example, we lived without electricity for over a year and a half before installing a solar electric system. We also lived without running water, using rainwater catchment and a homestead pond to meet all of our water needs. I wrote an eBook that describes all the details of our off-grid lifestyle, with questions and advice to help you make the right off-grid choices. Brian and I have homesteaded now for almost 20 years. We’ve rented for 14 of those years, lived in both the country and the city, raised almost every farm animal imaginable, and gardened in three different zones. If homesteading is your dream, I’m here to tell you, it’s attainable! Homestead Honey is here to support you as you live your dream. Building a Tiny House – A series on the process of building our 350 square foot tiny house. 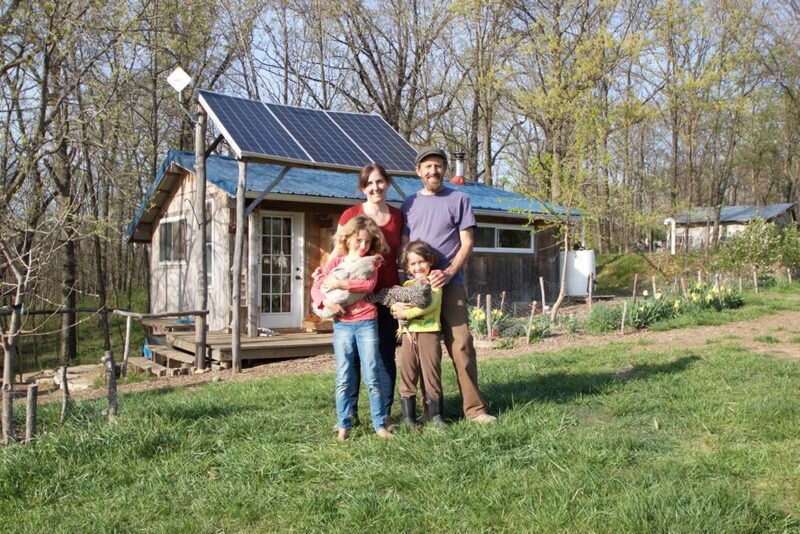 Living Off-Grid – What exactly is it like to start an off-grid homestead on raw land? How do you cook, sleep, use power tools, collect drinking water, and stay warm while building a house? Find the answers in these blog posts! Organic Gardening – I am totally passionate about growing food! From starting a garden from scratch to growing food year-round I love to share! The Homestead Kitchen – From fermentation, to raw dairy, to homegrown cured meat! I love preparing food, and we eat well on our homestead! Find recipes and inspiration for from-scratch cooking. My email newsletter delivers the best in off-grid living, gardening, and homesteading inspiration to your inbox. Plus, you’ll be the first to know about special opportunities, and exclusive discounts on eBooks and Courses! When you subscribe, I’ll send you a copy of Your Radical Homestead as a bonus. This dream book is about stretching our ideas about homesteading, articulating a vision for your Radical Homestead, celebrating what you’ve accomplished this year, and moving you forward into your wildest dream future. It is my passion to help others fulfill their homesteading dream. I spend a lot of time responding to emails and comments and sharing my very best content on this blog. If you are wanting to start homesteading, or if you need support with a big transition, I also offer one-on-one life and business coaching. Send me an email at teri (at) homestead-honey (dot) com and we can talk about how coaching can help you make your dreams happen! Homestead Honey offers Sponsorships to select small business owners. Attract YOUR ideal customer with affordable advertising on Homestead Honey. Contact me at teri (at) homestead-honey (dot) com.